Moving the Needle: Brian Bogusevic plays the hero with a walk-off grand slam, +.817 WPA. It hasn’t been a smooth 2011 for Carlos Marmol. At one point he lost his job as closer, but he’s since regained it. Last night he came out for the ninth, and for a while he looked like typical Marmol: a few singles, a walk, a wild pitch. It amounted to a bases loaded, one out situation. On a 2-2 pitch Marmol delivered one outside, and Bogusevic put a charge into it, sending it well over the 404 sign in center to win the game. Carlos Pena: 2 for 2, 2 2B, 2 BB. Jimmy Paredes: 2 for 4, 2 2B. He’s had a nice little run since getting promoted to the majors in late July. Moving the Needle: Jacoby Ellsbury drives home the only runs against James Shields, +.250 WPA. 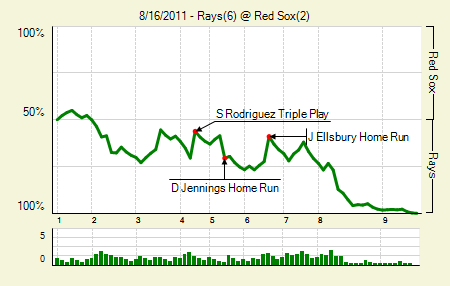 Runs were scarce in the daytime portion of yesterday’s Rays-Sox doubleheader. Evan Longoria drove home a run in the first, and then Ellsbury homered with two on and one out in the third. That was all anyone would get, which is what you might expect from a Shields-Jon Lester matchup. Jon Lester: 7 IP, 3 H, 1 R, 1 BB, 8 K. One walk is a nice change after he walked nine in his last two starts. James Shields: 8 IP, 3 H, 3 R, 1 BB, 6 K. It was his second complete game loss of the season. 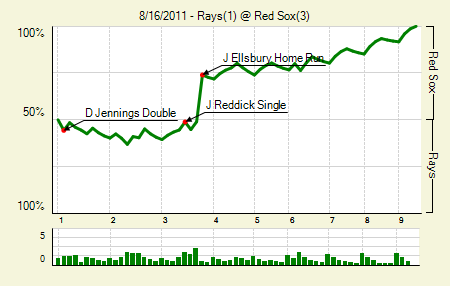 Moving the Needle: Sean Rodriguez hits into a triple play, -.143 WPA. Twice in two days we’ve seen a triple play, though this one was in more of a traditional mold. Rodriguez grounded one to third, and Jed Lowrie started the around the horn triple play, ending a Rays rally in its tracks. Desmond Jennings: 2 for 5, 1 HR. Imagine if he’d been up all season. Jeff Niemann: 9 IP, 3 H, 2 R, 1 BB, 10 K. I wonder when the last time a team had pitchers with complete games in both ends of a doubleheader. Since the start of July he’s thrown 58 innings in eight starts, with a 1.71 ERA and 3.27 FIP. 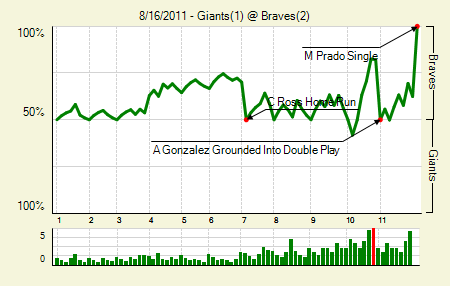 Moving the Needle: Martin Prado knocks in the winning run, +.375 WPA. For the second night in a row the Braves won in walk-off fashion. Last night they held a 1-0 lead heading into the seventh, but Cody Ross led off the inning with a homer to tie it. The stalemate lasted until the 11th, when a Brooks Conrad double set up Prado, whose ground ball single brought him home and ended the game. Randall Delgado: 6 IP, 1 H, 1 R, 1 BB, 4 K. He was removed immediately following the Ross homer. It was a good day for young Braves pitchers; Arodys Vizcaino pitched scoreless ball in the 10th and 11th. Guillermo Mota: 3.1 IP, 2 H, 0 R, 1 BB, 2 K. That’s some brilliant work in emergency relief, after Jonathan Sanchez left with a sprained ankle. It’s the fifth time this season he’s gone three or more innings in an appearance. From a quick scan of the game logs it appears the last time he did that, before this year, was on May 29th, 2006. Moving the Needle: Mike Cameron tops a three-run first with a two-run single, +.132 WPA. A Bryan Petersen triple set ’em up, and the guys behind him knocked ’em down. Greg Dobbs got the Marlins on the board with a single, and then Cameron knocked in a pair with his single, giving the Marlins a 3-0 lead. 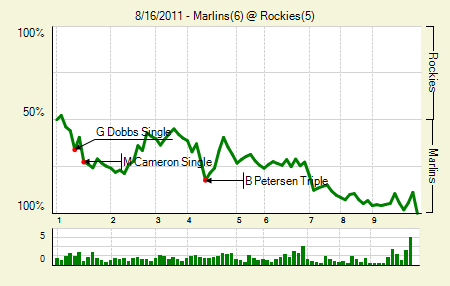 The Rockies battled back with a pair of solo homers in the second, but the Marlins kept their distance. Jason Giambi did hit a pinch-hit homer in the ninth to bring the Rockies to within one. Bryan Petersen: 3 for 5, 2 3B. He was one of three players to triple twice last night. Anibal Sanchez: 8 IP, 5 H< 3 R, 2 BB, 7 K. All the runs were on solo homers. Moving the Needle: Tyler Flowers lines into a double play in the 11th, -.327 WPA. So many big plays were overlooked by WPA in this one. The Indians tying run in the ninth? It came on an out, so the WPA will always favor the hit that got the man to third in the first place. Juan Pierre’s walk-off single? He had runners on second and third with one out, so the Sox had a high probability of bringing home the run. The big turnaround came in the 11th, when Flowers came up with runners on first and third with one out. 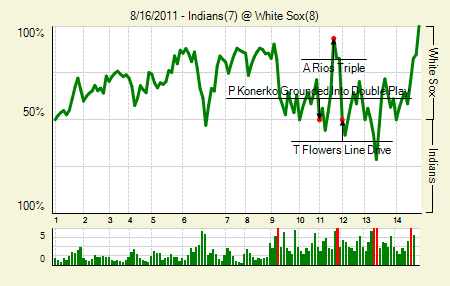 The Sox had an 82.7% chance of winning at that point, but Flowers lined one right to Jack Hannahan at third. He went to first, and that was that. It helped that the runner seemed to be going with the pitch. Alejandro De Aza: 3 for 7, 2 3B. He drove in two and scored another two. Travis Hafner: 2 for 7, 1 HR. He hit a big homer in the late innings to bring the Indians to within one. 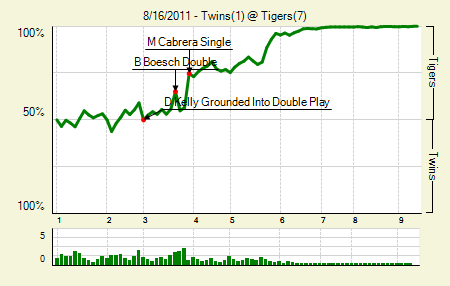 Moving the Needle: Miguel Cabrera’s two-run single gives the Tigers a lead, +.182 WPA. After suffering defeat in the series opener, the Tigers stormed back yesterday. Cabrera got them started with a two-out single in the third that brought home a pair. They went on to single the Twins to death in the fifth, ending up with five runs by the end of the inning. Brennan Boesch: 1 for 5, 1 2B. He scored three runs, thanks to fielder’s choices and such. Justin Verlander: 7.2 IP, 7 H, 1 R, 1 BB, 8 K. If you’re going to give up nine to the Twins, it’s always nice to have Verlander on the mound the next night. Moving the Needle: Yuniesky Betancourt misses the squeeze sign, -.136 WPA. 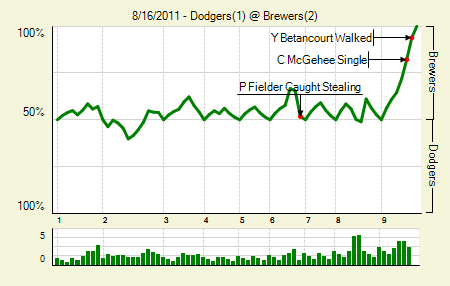 In the sixth, with the scored tied at one, Prince Fielder loomed on third with Betancourt at the plate. Fielder broke for home on the pitch, but Betancourt apparently did not pick up the sign. He swung though the pitch, leaving Fielder an easy target. The Brewers went on to win on a walk-off — though it wasn’t a big WPA swing, since it came with the bases loaded and none out. Yovani Gallardo: 8 IP, 4 H, 1 R, 1 BB, 9 K. That’s twice in his last three starts he’s gone eight while allowing just one run. Chad Billingsley: 7 IP, 4 H, 1 R, 2 BB, 5 K. That’s a nice bounceback after getting knocked around by Philadelphia last time out. Moving the Needle: Salvador Perez brings the Royals closer with a double, +.214 WPA. 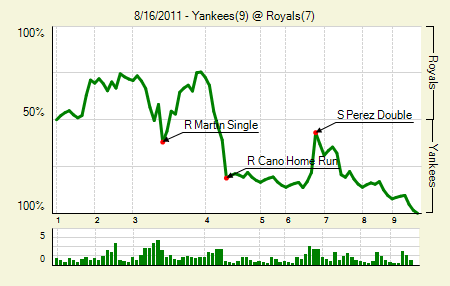 The Royals brought the runs, but every time they scored the Yankees had an answer. They went ahead in the first, only to fall behind again in the third. 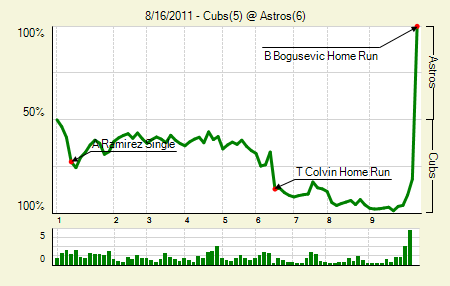 They then re-took the lead in the bottom of the inning, but lost it again in the top of the fourth. In the sixth they again got to Ivan Nova, singling and walking ahead of Perez’s two-RBI double, which brought them to within one. But the Yankees went to the bullpen, which pitched 3.2 scoreless innings. Robinson Cano: 2 for 5, 1 HR. He drove in four, including a three-run homer in the fifth that concluded a 12-pitch at-bat. Derek Jeter: 2 for 6, 1 2B. He’s up to .326/.380/.458 since coming off the DL on July 4th. 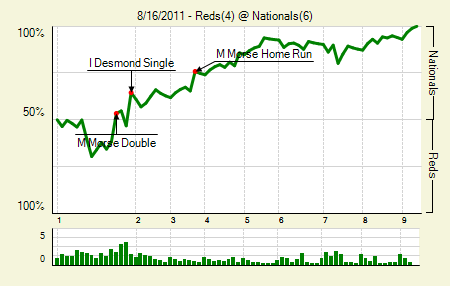 Moving the Needle: Ian Desmond’s bases loaded single brings home a pair, +.177 WPA. This one got a little wild in the first. Jay Bruce and Ramon Hernandez singled home runs in the top half, but the Nationals answered back. With the bases loaded and two outs Desmond brought home two with a single to center, giving the Nats a 3-2 lead. Michael Morse: 2 for 4, 1 2B, 1 HR. There’s little bad you can say about Morse’s numbers since he came to the Nats. The only downside that really stands out is that he’s walked only 22 times this year. Ryan Zimmerman: 2 for 4, 1 HR. Moving the Needle: Michael Young singles home a pair in the first, +.116 WPA. The Rangers got an early start in their most recent installment of Burying The Angels. After a walk and a double in the first, Young grounded one up the middle to bring home both runners. In the third they’d extend the lead to 5-0. The Rangers now lead the West by six games, with 39 to play. 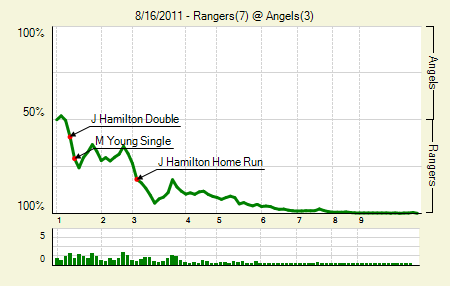 Josh Hamilton: 3 for 5, 1 2B, 1 HR. That’s only his third homer in the past calendar month. Derek Holland: 8.2 IP, 9 H, 3 R, 1 BB, 7 K. Through eight he had allowed just one run, but a pair in the ninth prevented him from recording his fifth complete game of the season. It’s the sixth time he’s gone at least eight this season. Moving the Needle: Lyle Overbay comes through with a go-ahead double in the ninth, +.608. For eight innings it was a ho hum Roy Halladay start. He allowed some base runners, and even a run when Overbay got to him with a man on in the second. 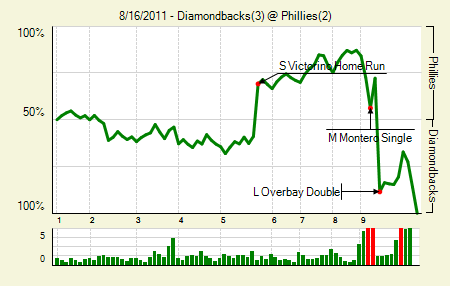 But it appeared that Shane Victorino’s fifth-inning homer would hold up. That is, until the Diamondbacks picked up two singles to start the ninth. Things looked up when Chris Young struck out, since the rest of the lineup looked like easy pickings: Overbay, Sean Burroughs, and Gerardo Parra. But Overbay came through with a double to right, bringing around both base runners and giving the Diamondbacks a lead. Chase Utley: 3 for 4, 1 2B. That’s a good game, but no RBI. So clearly it was worthless. Josh Collmenter: 6.2 IP, 8 H, 2 R, 1 BB, 8 K. It’s hard to complain about a performance that contains eight strikeouts and a two-run homer to Victorino. 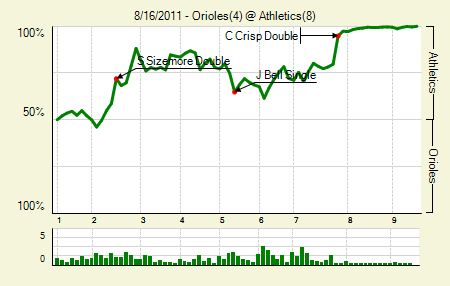 Moving the Needle: Coco Crisp’s double scores two and extends the A’s lead, +.150 WPA. Up 4-3 in the seventh, the A’s put together some insurance runs with a two-out rally. A pair of singles preceded Crisp’s double, and Hideki Matsui followed up with a single to make it 7-3. Jemile Weeks: 2 for 5, 1 2B. He’s 8 for 19 with two doubles and a triple in his last four games. Brandon Allen: 1 for 3, 1 3B, 1 BB. Again, doing whatever he can to stay freed. Moving the Needle: Neil Walker homers to tie the game in the ninth, +.435 WPA. Ho hum, another walk-off. This one wouldn’t have been possible, though, had Walker not hit a solo homer to lead off the ninth, which answered the Cardinals’ go-ahead run in the top of the inning. 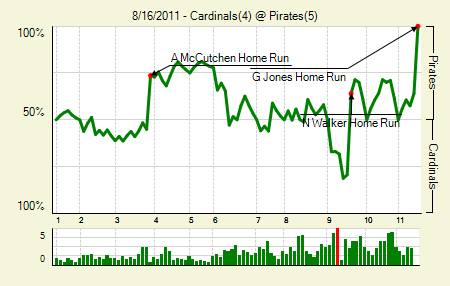 Two innings later Garrett Jones led off with a homer to give the Pirates another win. They’re doing the Brewers big favors in this series. Andrew McCutchen: 2 for 3, 1 HR, 2 BB. He drove in the first three runs. Albert Pujols: 1 for 4, 1 HR, 2 BB. Both walks were intentional. A down year with 30 home runs is still a bit hard to figure. Moving the Needle: Colby Rasmus clears the bases with a double, +.271 WPA. In the first the Blue Jays loaded the bases with two outs, which brought Rasmus to the plate. He pulled a double, which allowed all three base runners to score. 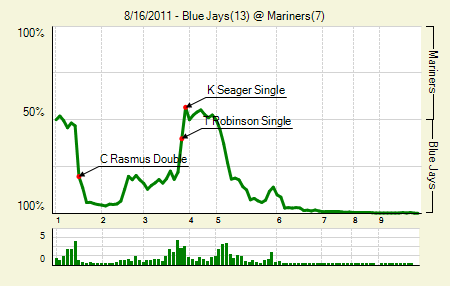 A single and a homer capped the huge first, giving the Jays a 6-0 lead before the Mariners could even get started. Jose Bautista: 2 for 2, 1 HR, 3 BB. Two homers in his last three games helps him extend his lead in the AL HR race. Aaron Hil: 2 for 4, 1 HR. He drove in four. That was only his sixth homer of the year, after hitting 26 and 36 in the last two years. 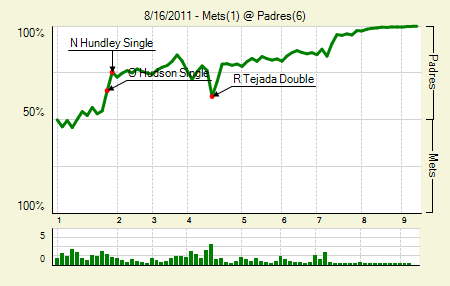 Moving the Needle: Ruben Tejada puts the Mets on the board, +.139 WPA. The Mets fell behind 2-9 in the first, but in the fourth they came back a bit. Tejada’s double gave them their first run and put runners on second and third. But the pitcher’s spot was up and they didn’t capitalize. Corey Luebke: 6 IP, 3 H, 1 R, 1 BB, 5 K. He’s gone 18 IP, 11 H, 4 R, 7 BB, 22 K in his last three starts. Nick Hundley: 3 for 4, 2 3B. There’s the third two-triple game. It’s also the most improbable. We hoped you liked reading The Morning After: Game Recaps for August 16th by Joe Pawlikowski! Roy Halladay going 9 innings with 14Ks and no unintentional walks isn’t noteworthy? For lots of other people it would have been the biggest day of their life. For Roy Halladay, it was Tuesday. No, for Roy Halladay, it was a failure. For Charlie Manuel, it was a Tuesday.